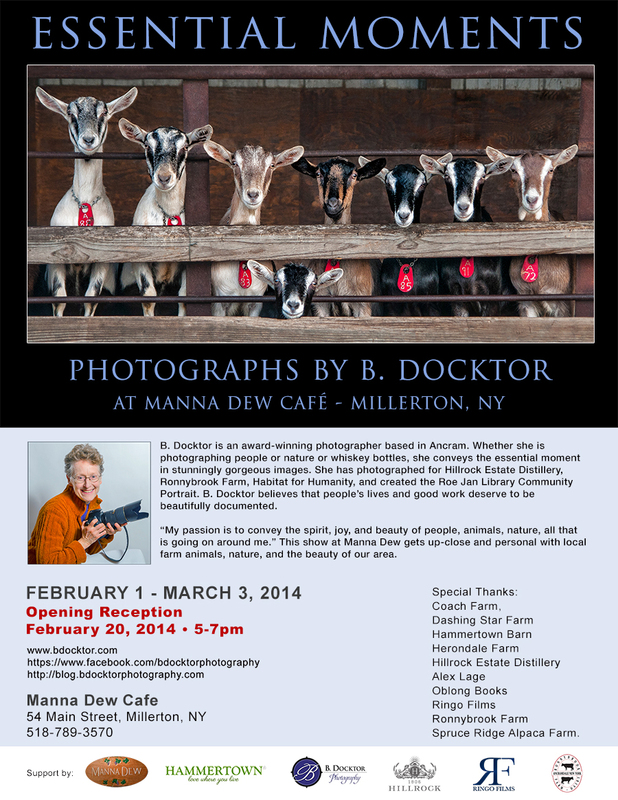 This month, my photography exhibit “Essential Moments” is at the great restaurant, Manna Dew Café, in Millerton, NY. When I install a show of my work, I love getting to transform the way a space feels. Manna Dew is in a lovely old building a few doors from the Millerton Moviehouse, and the photos, (many are canvas gallery wraps) look excellent against the old wainscoted walls. Beautiful local farms are represented in this show–the Coach Farm goats, sheep and cows from Herondale Farm, Spruce Ridge Alpaca Farm, and chicken and fin sheep from Dashing Star Farm. I am often amazed at how strongly people respond to my animal “portraits.” I believe it’s because I get close enough to really show their eyes that we feel so much kinship with them. You really get a sense of a personality. I am lucky to have access to these beautiful places and amazing animals! The reception is Thursday February 20, 2014, from 5-7pm.